Hollywood: Kate wants to change her name and she goes to the City Clerk’s office. The guy at the window tells her that her name change request is denied because she’s in the country illegally. After Kate protests, the guy at the window hands Kate a piece of paper and then says that an INS interview has been scheduled for her to prove the legitimacy of her marriage. Real life: First, the local City Clerk has nothing to do with immigration enforcement. To get married in California, you do not need to be a resident of California, nor do you need to be a U.S. citizen. See San Francisco’s County Clerk page and Los Angeles Registrar-Recorder/County Clerk’s marriage license page. For those of you who want to elope to Vegas, similar rules. Second, the City Clerk would not give you an appointment for INS. (INS may be easier for the actors to pronounce, but it ceased to exist in 2003. The functions of the former INS have now been split between Customs and Border Protection, U.S. Citizenship and Immigration Services, and Immigration and Customs Enforcement.) U.S. Citizenship and Immigration Services (or USCIS) handles its own scheduling. 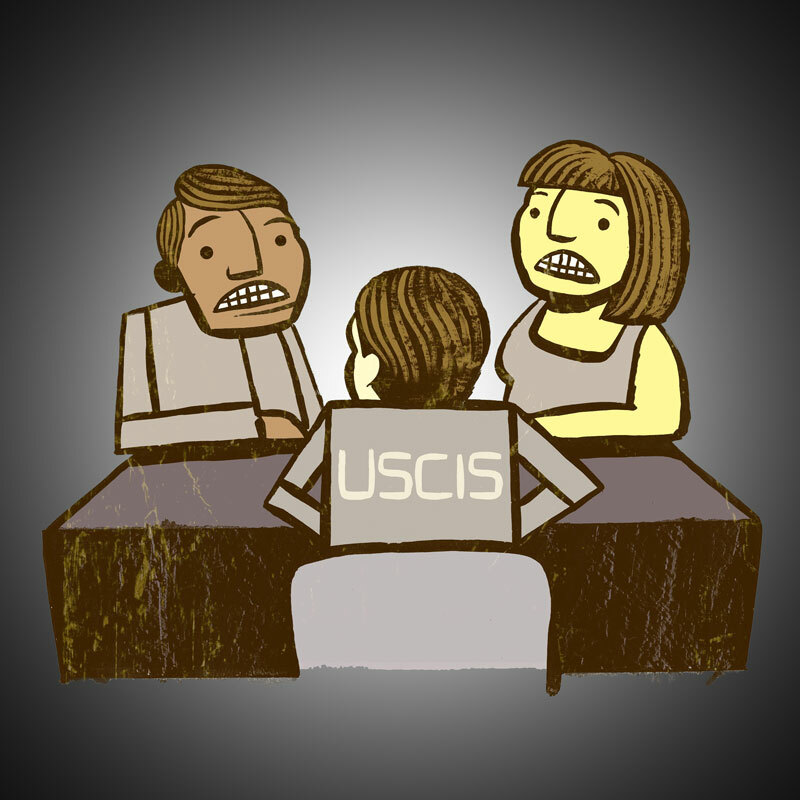 Third, USCIS does not tell you when you can expect a visit from the investigators, as that would defeat the purpose. They just show up unannounced. Hollywood: The agent shows up at Kate and Pete’s home, sits down in the living room, and starts asking them questions about their marriage. Real life: This interview usually happens in a very small room in a federal building. The officer sits across from the couple and takes copious notes. Sometimes, the officer will read the penalties for committing marriage fraud (imprisonment and fines) and then ask the couple if they still want to go forward. By the way, what is it with Hollywood’s fixation on deporting wives to Canada? Wasn’t that where Sandra Bullock was headed if she didn’t prove that her marriage to Ryan Reynolds was bona fide in “The Proposal.” Hmmm, that might be a future Hollywood versus real life blog. Double hmmm, Malin Akerman was in that movie too. If you would like to speak with me about your immigration questions, you may contact me. Or we can talk about my wife’s current crop of shows on the DVR: Revenge, Game of Thrones (probably not going to be any green card issues in that show . . . seems like if the Lannisters don’t like you, you don’t end up deported, you end up dead), Grey’s Anatomy, Private Practice, and Agents of S.H.I.E.L.D. (be interesting to see green card issues in that one . . . maybe Director Fury oversees a naturalization ceremony someday).